The Midvale Harvest Days Parade is a time-honored, family-oriented celebration held to honor the history of Midvale City. There are approximately 100 participants in the parade each year, consisting of vibrant and interactive floats, marching bands, local businesses, drill and dance teams, our own Midvale City Mayor and Council members, and our honorable Grand Marshal! Don’t forget your chairs, camera, sunscreen and water bottles. 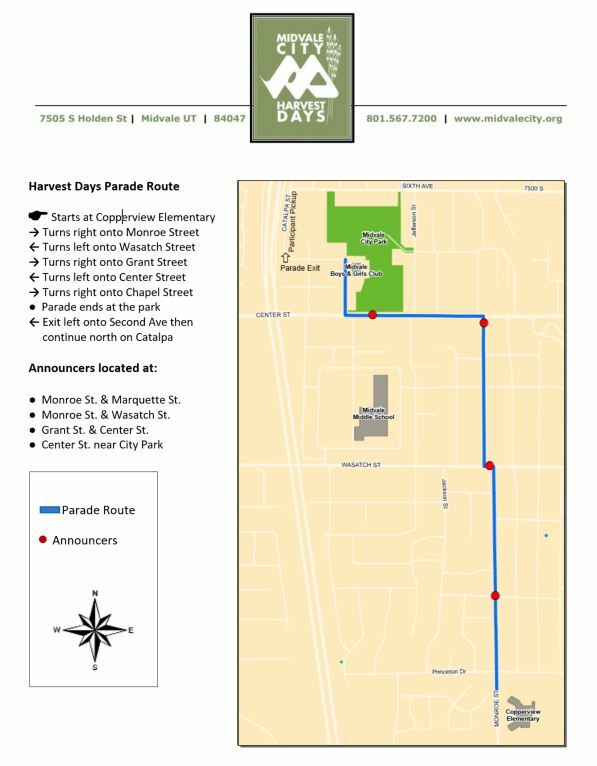 The Harvest Days parade will be held on Saturday, August 10, 2019. The parade starts promptly at 10:00 a.m. and runs for approximately two hours. Midvale City encourages youth groups, local businesses, bands, churches and all other groups to enter their float in this year’s parade. Parking is available at Midvale City Park. If you park in the surrounding neighborhood, please be cautious and thoughtful; leaving driveways, mail boxes, and fire hydrants available for access.